Natural Tea rich in antioxidants from Hibiscus flower (contains stevia, natural sweetener). 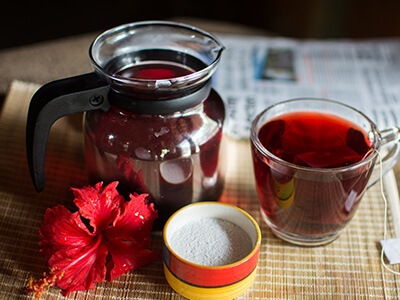 Hibiscus Tea is a refreshing and delicious herbal tea made as an infusion from the dried crimson or deep magenta-coloured petals of the Hibiscus flower. It is enriched with vibrant color, flowery aroma and rich flavor. It contains vitamin C and anthocyanins. It is a good option for replacing regular tea/coffee. 1. Hibiscus tea is a herbal tea made as an infusion from crimson or deep magenta-coloured calyces (sepals) of the roselle (Hibiscus rosa sinensis) flower. It is consumed both hot and cold. It has a tart, cranberry-like flavour. 2. It is a refreshing and delicious infusion drink, enriched with vibrant color, flowery aroma and rich flavor with the goodness of vitamin C and bioactive anthocyanins. 3. It is a very good and healthy option for replacing coffee as a caffeine-free beverage. 4. Drinking hibiscus tea gives relief from high blood pressure and high cholesterol, as well as digestive, immune system, and inflammatory problems. 4.It helps to cure liver diseases and reduces the risk of cancer. It can also speed up the metabolism and help in healthy, gradual weight loss.